Smaug The Dragon is enraged that his slumber and treasure have been disturbed. It's up to you to locate the missing Arkenstone while avoiding Smaug's vicious attacks. This is a game of risk, deduction and luck for 2-4 players. Use your allies and wits to avoid Smaug each round. 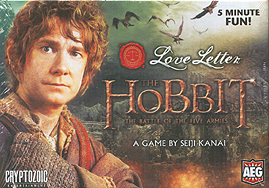 Find the Arkenstone and claim victory in a new spin on classic Love Letter!